Intang gracing the opening ceremony of the symposium, witnessed by Wilson (third left), deputy Miri Resident Emang Oyo Emang (third right) and others. MIRI: Iban is not only a mode of communication but can also be expanded to become a language for learning, particularly among the community. As such, the community should be proactive in using their mother tongue to ensure it would continue to progress. In stating this, Deputy Minister of Rural and Regional Development Datuk Alexander Nanta Linggi said he regretted that many Iban scholars preferred to communicate in other languages, rather than using their mother-tongue. “Although it may not be wrong to speak in other languages, but as Ibans, we must speak in our own language. “We should feel more at ease to express things in our own language and this is the same for the person with whom we are talking to, if he or she is an Iban,” he asserted. Nanta insisted that the Iban language should not be ignored and felt this was not the way to treat our own mother-tongue. “Thus, this will plant the interest in the younger generation and will encourage them to further expand the language before mastering other languages,” he advised. Nanta said this in his speech which was read out by Miri District Officer Boniface Intang Apat, at the officiating of `Iban Symposium’ at Institute of Teachers Education, Sarawak Campus here yesterday. Three working papers were presented at the workshop by professional Iban intellectuals and speakers namely Padang Luna (Assistant Director of Ethnic Language Unit, Curriculum Development Division, Ministry of Education Malaysia), Dr Chemaline Osup (Head of Modern Language Department, Faculty of Languages and Communication of Sultan Idris Education University, Tanjong Malim, Perak) and Professor Madya Dr Madeline Brema (Tun Fatimah Hashim Women’s Leadership Centre, Universiti Kebangsaan Malaysia, Bangi, Selangor). Attending the symposium themed `Betungkatka Adat, Penemu Digenggam Sereta Pengarap Dikemerat’ (Upholding of Tradition, Knowledge and Belief) were Iban longhouse chiefs, community leaders, teachers and trainers of Iban language from throughout Sarawak. 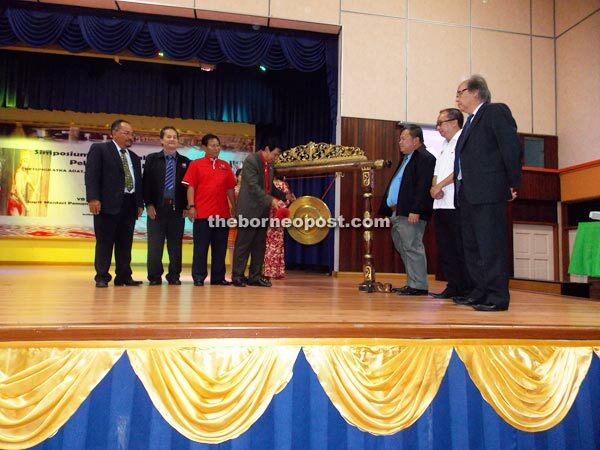 The event, the first of its kind ever being held in the state, was organised in collaboration with Miri Iban Community Leaders, Institute of Teachers Education, Sarawak Campus, Miri and Radio Television Malaysia (RTM), Iban Service, Miri headed by organising chairman Pemanca Wilson Siang Lim (Miri Iban community chief).